Free space for local charities and non-profit making organisations. If you’d like your organisation to be listed here and in our magazine, please email the details to: ce@insidemagazinelocal.co.uk. Since 1947 Scouts and Guides from across Waltham Forest have been performing on stage. This years show marks our 44th performance and promises to be our best yet! The show includes well known songs from the West End and the charts, as well as hilarious comedy sketches. We promise that you will have a fantastic time. So book now and come and see the greatest show! Saturday April 27th 7.30pm. Chingford Parish Church, The Green, Chingford E4 7EN. The Harlow Chorus, soloists and the British Sinfonietta, directed by Edward-Rhys Harry. Saturday 27 April, 7.30 p.m. to 10 p.m.
Evening of friendly competition. Come along and test your knowledge on a range of subjects. Quiz Master – Colin Setchfield. Prizes and raffle. Please bring your own drink. £5.00 adults, £3.50 children. Contact Andrew or Christine on 020 8524 8729.
in and around Highams Park E4 from 10th – 19th May. There will be a range of artworks displayed in the local shops and cafes and pop up food and music events. The week will kick off with a Vintage Fair in the car park of Hale End library and finish with the Highams Park Spring Festival in The Highams Park. The trail will start on Friday 10th May, there will be a Vintage Market in the car park of Hale End library on Castle Avenue E4 9QD on the Saturday 12th from 11am to 4 pm and then there will be an Art Trail with art work displayed in cafes and shops in Highams Park for the following week. The week will finish with the Spring Festival on the 19th May happening in the Highams Park next to the lake from 11am till 4pm. Doors open 7.00 for 7.30.p.m. £10 including refreshments (tea/coffee and yummy cakes). Bring your own alcohol and nibbles. Meet up and have a space to walk and talk without fear of judgement. Can walk quietly or talk on any subject you wish too, no expectation. One hour walk in Epping Forest. Chance to go for a cuppa after too, at a nearby cafe. you’ve never danced before, now is a good time to start. Good for exercise and good for the brain. No partners needed. We’ll be very gentle with you. This is an large annual event with great food, rides and entertainment. A DAY OF FUN FOR ALL THE FAMILY! Enjoy fun for all the family on Sunday 2nd June at Loughton Cricket Club, where two of Teens Unite’s most popular events will come together for an unforgettable day, suitable for all ages. Those aged 4-13 will run, climb, crawl, jump and slide their way around the assault course, in Teens Unite’s Junior Warrior Race. Participants will be entered into an age appropriate category as they set off from the start line to overcome a series of obstacles along the way. Alongside the Junior Warrior Race will be Teens Unite’s notorious It’s a Knockout event; where teams will compete on the inflatable assault course. Participants should look forward to giant inflatables, hysterical games, oversized props, water and gallons of foam, as they work together in a bid to be crowned Loughton’s winning team for 2019. Gather your friends, family, colleagues or sports team to be a part of the It’s a Knockout competition. You don’t have to participate to be a part of the action. Spectators are invited to come and watch the antics and enjoy a selection of stalls, games, attractions and BBQ. Teens Unite, established in Broxbourne, Hertfordshire, opened a second office in Loughton in September 2018. Founded 12 years ago by Karen Millen OBE and Debbie Pezzani, the charity supports young people who have been diagnosed with cancer. Saturday June 8th 12.15 – 7.00pm. Chingford Parish Church, The Green, Chingford E4 7EN. Continual short concerts of choral and instrumental music throughout the afternoon as part of the Chingford Village Festival. Admission free. Pretty Muddy® isn’t like any other fundraising event. It’s a muddy obstacle course that everyone, no matter their ability, can take part in! Choose from either 5k or 10k Pretty Muddy events. Climb, crawl and slide your way to beating cancer. Pretty Muddy Kids is our brilliant muddy obstacle course just for the little ones. They can take on the obstacles, crawl through the mud put and have fun with friends, all the while helping raise valuable funds for life-saving research. Please note, all children taking part must be at least 1.2m tall on the day of the event and have a supervising adult. People of all ages, abilities and backgrounds take part in the Race for Life, and with more than 150 Race for Life 5k events across the UK, you won’t need to travel too far to find one. Saturday July 6th 7.30pm. Chingford Parish Church, The Green, Chingford E4 7EN. South West Essex Choir, soloists and orchestra directed by Andrew Sackett. Admission free. Packed lunches welcome! Tea and refreshments provided. Collection in aid of music funds. meeting in CHINGFORD. Are YOU a teenager (12-17) with a relative or friend whose drinking gives YOU a problem? ALATEEN is there for YOU. For details of this and other meetings phone 020 7403 0888 (10am-10pm). Welcomes new members. No complete beginners. No league games. Every Wednesday 7.30pm to 9.30pm at Trinity School, Woodford Green, Parking available. Please ring Joan on 020 8527 0299 for details before attending. We are a friendly badminton club that would like to invite new members to our club on a Monday evening 7.30pm to 9.30pm at Trinity School, Mornington Rd, Woodford Green. 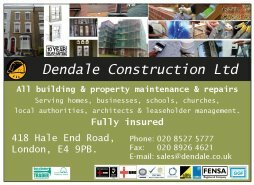 Further details are available from Della on 020 8529 6020 or Michael on 0794 147 9485. Every Wednesday, 9.30am to 11.30am. The Peter May Sports Centre, Wadham Road, Walthamstow E17 4HR. All ages and standards welcome and equipment provided if needed. Just turn up and join in. For more details and information please contact Dave or Nikki. Email:- nchesters@hotmail.com or phone 020 8529 1710. A friendly, happy club, we meet 13.30 every Wednesday @ Chingford Horticultural Society Hall, 151-153 Larkshall Rd, E4 6PE. Free parking, 444 buses nearby. All abilities, singles or pairs. Just turn up or phone Brian Howlett on 07952 185 084 or Avril Smith on 020 8529 2713. If you have played or been taught bridge for 6 months or more these practice sessions could be for you. Card play followed by discussion on how the bidding and play could be improved. Small friendly group with a break for tea/ coffee and biscuits. Wednesdays 2.30-4.30pm and Thursdays 7.30-9.30pm. Tution given by fully qualified Bridge Instructor at Horsley Road, Chingford E4 7HX. www.eastlondonbridge.co.uk. 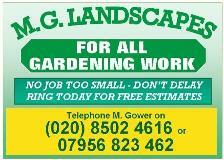 or phone Ray Green 020 8281 8376. Meet the second Friday of each month at the Chingford Horticultural Hall, Larkshall Road, Chingford E4 (opposite Dale View Crescent). Commence at 7:30pm, the meeting fee is £1.50, which includes refreshments and a raffle. Talks are primarily concerned with cacti and succulents, but cover a wide range of subjects. Visitors will also have an opportunity to purchase small plants to start or increase a collection. Please contact 020 8529 5518. We meet once a month on the SECOND Saturday at Emerson Park, Hornchurch, from 10-30am.til 2-30pm. We are a group of sociable men & ladies. We will give plenty of guidance to help people carve. Why not come & visit us and see what we achieve other than chatting. INFORMATION:- Please ring Martin on 020 8590 1824. This friendly theatre group rehearses at Mornington Hall, The Green Walk, North Chingford E4 7EN and puts on two or three productions a year. New performing members and helpers (back stage, front of house etc.) always needed! Rehearsals most Monday and Wednesday evenings – contact cadoschingford@gmail.com to arrange a time to pop along and say hi, or see www.cados.biz for more information. The Whipps Cross hospital League of Friends have a monthly car boot sale on the first Saturday of each month from March to November, from 7am to 12 noon on the staff car park in the hospital grounds. Bookings only through Mrs. B. Fone 020 8556 3492 between 5pm and 9pm. Carers FIRST is a not for profit organisation supporting people who look after a relative or friend who due to ill health, physical or mental illness, disability, frailty, or addiction cannot manage without their support. We provide information, advice, guidance, emotional support, training and activities, giving carers an opportunity to have a break from their caring role and help them to get the support they need. Every other Thursday. Nature themed indoor and outdoor activities for pre-school children (24 months upwards). Activities may include natural play, storytelling and arts and crafts, All children must be supervised by an adult (1 adult: 2 children). Meet at the Grange Farm Centre (off Grange Farm Lane). Suggested donation to Essex Wildlife Trust of £5.00 per child. All enquiries please to Claire Rogers at clairer@essexwt.org.uk or call 020 8500 3094. We are a friendly local operatic and dramatic group based in Walthamstow, specialising in the works of Gilbert and Sullivan, rehearsing on Tuesdays 8-10pm (all) and Wednesdays (principals) at St. John’s Church, Chingford Road, Walthamstow, E17 4LH. Established in 1912 and still going strong. Why not join us on one of our Sunday walks which vary from 5 – 8 miles? A day in the forest, the countryside around London or even in London itself. We are a friendly group but for more information contact 020 8926 4593 or e-mail jhhfz@hotmail.com. (formally Chingford Jazz Club). Live jazz every Tuesday at the Police Sports Club. Chigwell High Road IG7 6BD. Drinks bar & hot food available. Comfortable seating. Sessions start at 8pm and finish at 10.30pm. Ample car parking. Admission £7.00 non members, £6.00 members. Come and hear a different 6 piece jazz band performing every week. Phone either Sheila or Dave on 020 8925 8313. We meet September to July, every 2nd Thursday of the month at 7.30 p.m. in the front hall at Chingford United Reformed Church, Buxton Road, North Chingford. All levels of ability, varied programme and occasional Saturday workshops. 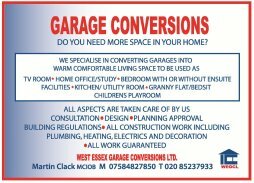 Come and see what we do or for further details please phone Gerald 020 8923 1134 or Pam 020 8529 3094. Evening meetings are held on the second Wednesday of each month from October to April at the Chingford Foundation School, Nevin Drive. Guest speakers give talks on a wide variety of historical subjects. Three coach trips to places of historical interest are organised each summer. There is a tea interval with a selection of books on local history for sale. Membership costs £7.00 (guests £1.50). For further details please ring 020 8504 6340 or email filmview@talktalk.net. Larkshall Rd (opp Dale View Crescent) FOUNDED 1889 Open to all residents of Chingford and surrounding areas. Aim – to further interest in horticulture. Membership to our society is £4 per year. This gives discounted purchases on garden accessories at the Horticultural Hall — open on Sunday mornings 9.30am to 12.00 noon. To join, visit the Horticultural Hall or contact membership secretary; -Mrs S. Kilmartin 020 8524 0969.
meets every Wednesday evening, May to September 1900hrs till dusk at the Track in Ridgeway Park, Peel Close, Old Church Road, E4. From September to the end of April between 1900hrs and 2130hrs we meet at St Edmonds Hall, Larkswood Road, E4. Also EVERY Sunday morning we meet at the track in Ridgeway Park to carry out maintains. The Miniature Railway runs every Sunday and Bank Holiday Mondays from April to September 1400hrs to 1730hrs. 82 Woodland Road (opp. Parish Church), North Chingford E4 7EU. Tel: 020 8524 0754. Established in 1930 we are a small but happy church. Visitors would be very welcome to our Sunday service of hymns, prayers and a sermon of readings from the Bible and the Christian Science textbook. Wednesday evening meetings are fairly informal with some readings, hymns and then members of the congregation tell how prayer brought healing of illness, relationships and other problems encountered in daily life. Sunday Service 11am – 1 hour, Sunday School 11am, Wednesday meeting 8pm – 1 hour. We also have a bookshop and a room for quiet thought and study open Monday 10.30-12.00 am and Friday 3.00-4.30pm. Country Dancing for all tastes; beginners welcome. Meets every Tuesday 8:00pm – 10:00pm at Mornington Hall, Green Walk, E4. For full details phone Arnold on 020 8529 6730. We have classes every Sunday at Larkswood Leisure Centre in New Rd from 12.00 to 1.00pm. Karate Classes are also held every Tuesday at the Peter May Sports Centre in Wadham Rd from 6.15pm to 7.16pm. We started Chingford Karate Club in 1985 and most of the Black Belts in the area all started with us as White Belt beginners. You can do the same. There is a now a FREE introductory lesson for all new beginners. We welcome adults, families and children over the age of 6. Just wear some loose fitting clothing and come along 15 minutes before the class starts. New members will be very warmly welcomed. We are a friendly club with a busy golf and social programme. Five day membership is available on one of the prettiest golf courses in Essex. Lady golfers interested please ring Sally for a chat on 01371 878304 or Vivien on 020 8529 1342. Chingford Ladies Golf Club, 18A Beresford Road, Chingford E4. First Thursday of the month 2.00 – 4.00pm, at Quaker meeting House, 1a Jewel Rd, E17 4QU [off Hoe St]. £4 per session, refreshments included. No need for a partner, just turn up, beginners welcome. For more information phone Pat on 020 8556 3508 or e-mail jean.duggleby@virgin.net. Every third Tuesday of the month, free hospitality event, 10.30am-12.00noon (please arrive before 10.30am thank you) at Sanjos, 164 Queens Road, Buckhurst Hill, IG9 5BD. Tel: 020 8505 5775. www.sanjotheexperience.com. are a friendly musical society based at Waltham Forest College. We are looking for new members to take part in our 7th – 9th July production of ‘Bugsy Malone’ at the Kenneth More Theatre, Ilford. Rehearsals are held on Tuesdays and Thursdays from 7.30 to 10 pm. If you enjoy singing and/or dancing, please contact Doreen on 020 8539 9474, e-mail damedoreen@yahoo.co.uk for full details or visit www.collegeoperatic.co.uk. We have been in existence for over 40 years and are looking for new members as well as visitors to our exhibitions and sales. Our artists exhibit on The Green, North Chingford, the first Saturday of each month through the summer months. We also hold indoor shows at the United Reformed Church Halls, Buxton Road, North Chingford. For further information please contact Leigh Clothier on 020 8524 7934. We are a registered charitable not-for-profit group catering for lonely or disadvantaged adults in our community. We meet each Wednesday morning from 9:30 a.m. to 12:30 p.m. in the Mary Cotton Hall, St. John’s Church Centre, Buckhurst Hill and offer a wide variety of different arts to explore. Come and join us in a relaxed and friendly atmosphere and unleash your creativity. For more information, please call Antoinette on 020 8504 8033 or email acnrcp@hotmail.co.uk. (www.forestmusical.co.uk) We are a friendly musical theatre group who are looking for new members to join our forthcoming production of Rodgers and Hammerstein’s Carousel. Winners of the NODA London Region Kathleen Oyler Trophy for Best Chorus, we rehearse in Loughton on Tuesday and Wednesday evenings and perform two large scale productions each year at the Kenneth More Theatre and other locations. If you are interested in musical theatre, singing, dancing and acting or if you love costumes making props or working behind the scenes contact lauren@forestmusical.co.uk for more details. every Sunday during term time 4-5pm Sewardstone Church E4 7PA (opposite Epping Way). All workers are police checked. Bus pick up from stops around Chingford (see website for locations). Children play games, win sweets and prizes and learn about God. Call Nick for further information/queries 07973 462 741, website www.kidzklubchingford.co.uk or find Kidz Klub Chingford on Facebook. FREE Led Walks for Older Adults. meet every Thursday 1.30-4.30pm at Loughton Bowls Club. New members welcome, preferably as pairs. Contact Paul 020 8281 7202 evenings. welcomes new members. Wednesday between 1pm—3.30pm. at Chingford horticultural society hall, larkswood road, Chingford. If interested phone 020 8529 3411. EST.1912. Worcester Road, Higham Hill, Blackhorse Lane, Walthamstow E17. New and experienced members required. Keep fit and active and find a new social life to enjoy. 7 days a week from noon to dusk. For new bowlers we will provide tuition and equipment. For more info: JOHN EDLER on 020 8529 6637. Our Club night is held on the first Tuesday of each month at Valentines Mansion, Emerson Road Ilford from 7.45 to 9.45 p.m. Entrance is £1.50 which includes light refreshments. We have a varied programme of speakers which is either medical or of general interest together with fundraising events throughout the year. If you or your partner is diabetic and would like to meet other people for support, please come along where you are assured of a warm welcome. Our website is: www.ilford-and-district.diabetesukgroup.org and if you would like further information, please phone Joan on 020 8500 9721. You will be taught vocal and breathing techniques; harmony and how to perform in public. These courses are for beginners who have never used computers and those who want to develop their use of the internet. meet every Tuesday from 7.30 to 9.30PM at Roding Valley High School. Tuition given to new members. Further details from Colin Bond on 020 8257 0388. On the second Friday in the month, the Rotary clubs of Roding, Loughton, Buckhurst Hill and Chigwell hold a Memory Cafe. It is held at The Loughton Club, Station Road, Loughton. This is for people who have some form of memory problems and their carers, 10 am until 12 noon. Come along and enjoy the company, with tea/coffee cake, a sing song, quiz and bingo. There is no charge for this, it’s free. If anyone would like to join us please contact. Hilary Wrightman 07836 671 582. We are Akademi, a South Asian Dance Charity. With the support of Waltham Forest Culture we are taking over the monthly tea dances taking place in Chingford Assembly Hall. During these tea dances There will be professional dancers on hand to show the steps (tango, waltz, foxtrot, samba and much more) – and music will be provided by DJ Mr Wonderful. Project supported by Waltham Forest Culture. Venues and dates: Chingford – Chingford Assembly Hall, Station Road, E4 7EN. Every last Wednesday of the month. Price: £5, free for carers. Payment on the door accepted, Time: 1pm – 4pm. For info and bookings: click here. Multiple Sclerosis is the most common disabling neurological condition affecting young adults. Branch Club Nights are the last Wednesday in the month (except January, August and December) 7.30 pm onwards in St. Edmund’s small hall, corner of Larkswood Road and Chingford Mount Road, E4. New members and supporters welcome. Outings during the year. Parkinson’s UK, celebrating 40 years into research for improved medication and ultimately a cure. The Waltham Forest Branch works to help people with Parkinson’s and their carers in today’s community. Just by joining your contribution will help many people. Our branch meets once a month at the South Chingford Congregational Church on the 3rd THURSDAY evening of every month, providing guest speakers and a social chat. An information support worker attends to give a variety of advice and help. Monthly outings are organized with transport provided. TREASURER URGENTLY NEEDED.We can’t function without one so is there a retired accountant out there to help us??? breathing walking meditation in Epping Forest. Using special yogic breath techniques, silent sounds to soothe/calm direct the mind. Rhythm/movement we will meditate, walking. Great for people who lack energy. Grief, depression, stress, self esteem, concentration…. become more peaceful and “keep your head when all around are losing theirs”!! The Probus Club of Loughton, provides an opportunity for retired and semi- retired Professional and business men to meet together, enjoy each others’ company and establish friendships. Our meetings are held at 12.15pm for 12.45pm on the 4th Tuesday of each month at Gilwell Park in Chingford. At each meeting, we have interesting talks by a wide variety of speakers and an enjoyable lunch. If you are looking for an organisation to join in your retirement and would like to find out more about the Probus Club of Loughton, please contact Derek Allen, the Secretary, on 020 8504 3074.
invites cyclists of all abilities, men and women, to join them on their club rides each Sunday leaving Redbridge Cycling centre, Forest Road, Hainault, IG6 3HP (On Hog Hill). Most rides start at 9.15am but occasionally earlier. Check our website at www.redbridgecyclingclub.co.uk beforehand for more details and exact start times. Instruction on group riding will be given to less experience or novice riders at the cycle centre fifteen minutes prior to departure. Introductory cycling sessions are also organised periodically. Again see website for further details. The club meets fortnightly at the Cycling Centre from 7.30 pm. They are friendly gatherings and provide an opportunity to chat about the pastime and sport and also to ride around the circuit (until dusk). For more details go to our website at www.redbridgecyclingclub.co.uk or telephone 01277 356 000. (Royal Society for the Protection of Birds) for NORTH EAST LONDON . Come and join us at our illustrated nature talks held on most 2nd Tuesdays of the month – a great way to meet friendly, like-minded people in your area while learning more about birds and wildlife. We meet at the Gwinnell Room, St. Mary’s Church, 207 High Road, South Woodford, E18 2PA. We also have a programme of local walks and join Havering Local Group for coach trips to visit nature reserves further afield. If you’re looking for a Challenge try Scouting! Fun, games, camping, learning new skills and team building are among many activities available to girls and boys aged 6 – 18 years and to adults who are looking for a challenge. If this could be you, and you’d like details of your local group contact The Scout Association at Gilwell Park, Chingford on 0845 300 1818 or email information@scout.org.uk. YMCA East London, Forest Road, Walthamstow E17 3EF. SHF is about connecting communities & empowering people individually & collectively through cue-sport. We are open on Wednesdays from 4.30-6.30PM at YMCA, to anyone diagnosed either with a disability or a mental health disorder resident within Greater London. All disabilities welcomed. To book please call 020 8503 2665 (Highams Park) or 020 8509 4600 (Walthamstow). South West Essex Choir is an SATB choir with about 100 members. We meet on Tuesdays from 7.45-10pm in the Methodist Church, High Road, Loughton, Essex IG10 1RB (a 10 minute walk from Loughton Central Line Station and on bus routes 20, 167). New members are always welcome. You must be able to sing but no audition is necessary. We give three to four concerts a year in venues throughout West Essex, conducted by musical director James Sherlock, who recently made his Carnegie Hall debut. See www.southwestessexchoir.org.uk or phone membership secretary Mary McElarney on 01992 812606.
presents evenings of Classical and Light Classical music on disc. Programmes are presented by the members themselves. Evenings are relaxed and informal occasions. We are not an elitist Society and you do not have to be very knowledgeable about music to enjoy the evenings. Entry is FREE and membership of the Society is just £5 for the season (First season only – £15 a year thereafter). Why not come for an evening for free and see if you enjoy it? We meet every Friday Fortnight at All Saints Church Hall, Church Avenue, Highams Park, E4. Meetings start at 7.30 prompt and finish at around 9.45. For further details call Andrew Golds on 8531 2938 or Judi Cooper on 8531 7418.
was established nearly 60 years ago in Walthamstow. We perform concerts locally in Waltham Forest, and also in some prestigious venues in London, including St Paul’s Church, Covent Garden. We rehearse every Monday from 7.30 p.m. until 9.45 p.m. at the Cornerstone Church, 149 Canterbury Road, Leyton (the corner of Essex Road and Canterbury Road). We play on Monday evenings 7.30-9.30 p.m. at Trinity Catholic High School, Mornington Road, Woodford. Mixed group and mixed ability. Contact: Michael 0794 147 9485.
based in and around Epping Forest. Epping Forest HF Group are a group of walkers of all ages (from 18 to 80+) who get together most Sundays and public holidays to explore different parts of Epping Forest, the surrounding countryside, Central and Greater London. Join us for a few walks first and consider membership at £4 per year. Walks are of between six and eight miles in length. See our library poster for details or view our website at www.efhfg.org.uk. Email info2009@efhfg.org.uk. Free women only walking group in Buckhurst Hill. Meet at The Toby Carvery. Full details can be viewed on www.exercisewithme.co.uk or call Victoria on 07706 700 666. Monday and Thursday evenings, 7.30pm. Quaker Hall, 1a Jewell Road, Walthamstow E17. New players always welcome. We are a friendly club with free tea and coffee. Bridge classes available for beginners and intermediate. Are you a fan, a collector or a Miniaturist? Join our bi-monthly afternoon meetings. 2.30 to 4.30pm on the 2nd and the last Friday of the month at 15 Westward Rd, South Chingford, E4 8LZ. 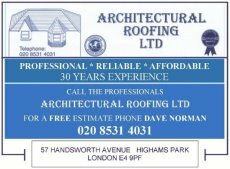 Contacts Norma Pollington 020 8531 7371, Kate Bundock 020 8524 5416. Every Monday, during term time, between 4.20pm and 7.15pm Literacy, Numeracy and Touch-Typing classes for primary and secondary dyslexic students. VENUE: Frederick Bremer School, Siddeley Road (off Fulbourne Road), Walthamstow E17 4EY. For further information please email Karen Sparkes, Class Co-ordinator at WFDACo-ordinator@outlook.com or call her on 07852 232 509. The Waltham Forest Probus Club is just one of the many Probus Clubs that are established in 23 countries around the World from Argentina to Zimbabwe. There are nearly 1,700 Clubs in the U.K. and the basic purpose of a Probus Club is to provide regular gatherings of persons who, in retirement, appreciate and value meeting others in similar circumstances and of a similar level of interest. We meet every third Monday of the month for lunch 12.20 for 1 o’clock lunch at the Royal Forest Hotel in Chingford. An interesting speaker is usually present at each luncheon. The club also arranges visits to interesting places now and then. in Chingford. We are a uniformed youth organisation that take on the traditions of the Royal Navy and the Royal Marines giving new skills, life skills and opportunities to young people between the ages of 10-18 years of age male and female. We parade on a Tuesday and Thursday at 48 Kings Road, Chingford. The times that we parade are 7.15pm-9.30pm. Contact phone number (020) 8529 7743 between the hours of 7.30pm-9.30pm on a Tuesday and Thursday. Fun for all the family. League standard welcome. Heathcote T.T. Club, St Edmunds Church Hall, E4 (coaching for young players) Red Triangle T.T. Club, YMCA Sports Hall, E17 (coaching for young players) Forest Community Centre T.T. Club, Guildford Rd, E17 Leyhall Sports T.T. Club, Cannhall Methodist Church Hall, E11. Please contact Membership Officer Ray Massey 020 8524 4289. Every Thursday at St Johns church hall, the High Rd, Buckhurst Hill @ 8pm cost £3. Every Tuesday 9.30 am – 12.30 pm, Scout Hall, end of Beech Hall Road, Highams Park.E.4. All Standards including beginners welcome. Flat shoes must be worn. £2.00 per session. Enquiries 020 8529 8865. “Learn to ride the waves of Life” with yoga and meditation. Powerful detoxifying yoga. Gain strength and excellent all round fitness – Gain! grace and peace in mind. Using movement, sound, breath and relaxation. Learn to master yourself. THURS 6.45pm-8.15pm. North Chingford [rail 3mins]. 6 week sessions pre book £48/drop in. if spaces. Sat Kartar m. 07890 909 928.